This April we will take advantage of serendipitous scheduling! Wendy Maruyama an internationally known artist and furniture maker is scheduled to speak at IUP on the Woodturner’s normal meeting date. Our meeting will be the opportunity to attend that presentation. We received the following invitation from BA Harrington, Director of the Wood Center @ IUP. 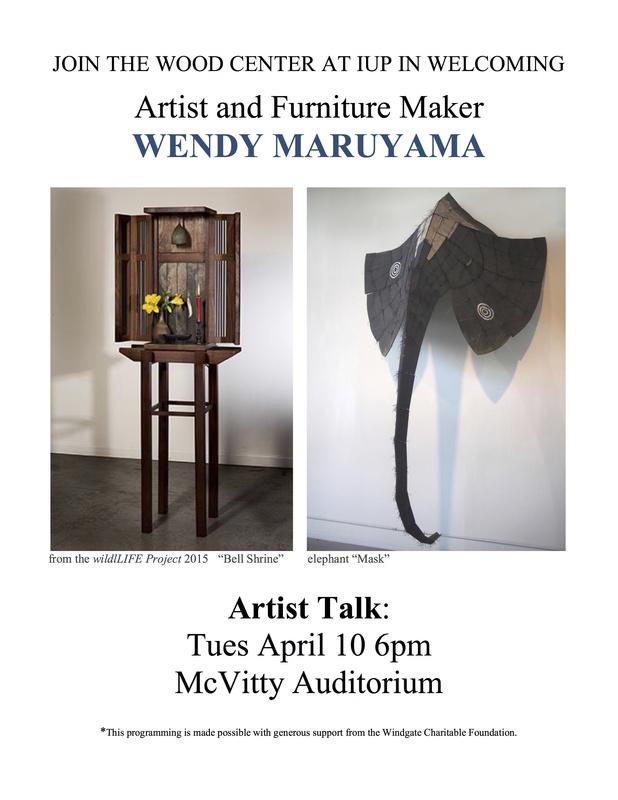 Please join the Wood Center at IUP for a talk by internationally renowned artist and furniture maker Wendy Maruyama on Tuesday April 10 at 6pm in McVitty Auditorium. Wendy recently retired from decades of heading the woodworking program at San Diego State University and is considered a member of what is commonly referred to as the “2nd Generation of Studio Furnituremakers.” Wendy has just returned from organizing and facilitating the “Design” component of the 6th international World Wood Day event that took place in Cambodia March 20-25. You are also welcome to join either of the woodworking classes in Sprowls G8 earlier in the day on the 10th to hear her speak about her experience at this wonderful new annual event (she will talk for approximately an hour starting at 11 and 2:30). Learn more about Wendy at her website found here: <http://wendymaruyama.com/home.html>. This entry was posted in Woodturning on April 2, 2018 by Greg.